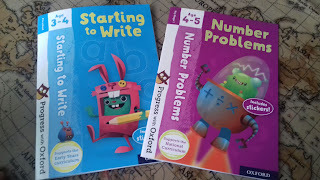 We've recently been checking out this fabulous new series from Oxford University Press. I love to blog and share great educational resources that I use in our Home Ed classroom with you all. So please read on to find out more about this new launch!! 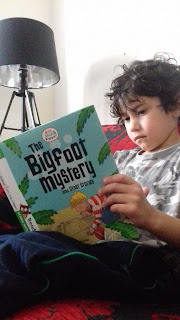 The Bigfoot Mystery and other stories - check it out here. As mothers of young children learning to read, we are all familiar with the characters Biff, Chip and Kipper! These well known characters are still featured in the new Read with Oxford series. I have used the phonics method to teach all my children to read. At the age of around 3 they have been able to sound out words themselves, using their phonetic knowledge. 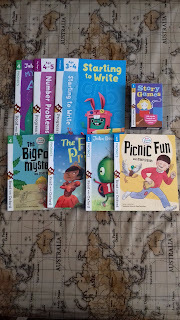 We have been using the stage 4 books in order to allow DS6 to become a much more confident reader, picking up these books whenever he feels like, and settling down in his chair to read by himself. He's enjoying the new series as each book consists of short stories which are simple enough for him to read independently and comprehend what he has read, making him feel great about his big achievement after he has finished each story. 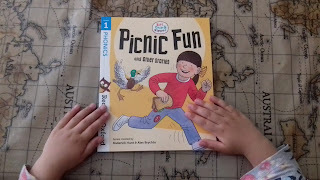 Picnic Fun and other stories - check it out here. DD3 has just started stage 1 after beginning to sound out her CVC (consonant vowel consonant) words. 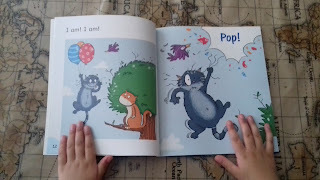 Each story has simple sentences and repetition of words in order for the child to quickly recognise and recall. 'Read with Oxford is a new range of readers for children aged approximately 3-8. Featuring much-loved characters, great authors, engaging storylines, and fun activities, Read with Oxford offers an exciting range of carefully levelled reading books to build reading confidence. Bob Bug and other stories - check it out here. From the first early reading steps all the way through to reading independence, the new levelling system – Read with Oxford Stages – has been designed to help parents find the perfect books to support their child’s reading journey at every stage. It enables, inspires, and empowers parents to independently identify, track, and nurture their child’s reading development. 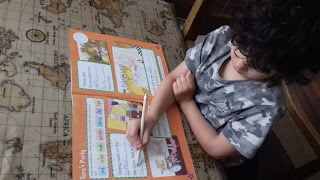 DS6 has been very keen to practise his phonics with this colourful new My Phonics Activity book which includes stickers (yes, always a winner when stickers are involved!) He eagerly takes out his book first thing each morning and completes some of the pages. As well as being revision for his phonics skills, it is also helping with his handwriting. 'Progress with Oxford is a new series of activity workbooks, created by subject experts, to develop children’s essential English and Maths skills. 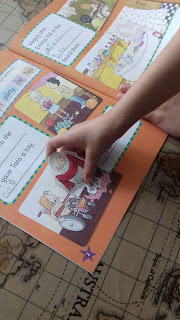 Check out My Phonics Activity book here. DD3 is loving her new book 'Starting to Write' I don't usually encourage workbooks from a young age as there are so many gross and fine motor skills that can be done through practical learning and play, however, if your little one is keen to follow in their older siblings footsteps and have their own workbooks then check out this vibrant new book. DD3 is getting to grips with using a pencil and enjoying making her mark in her new writing book. 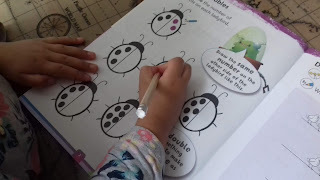 It starts off with following various dotted lines, quickly progressing onto letter formation. 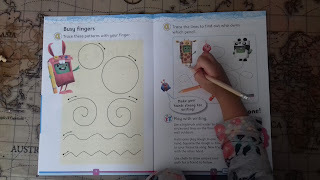 There are lots of 'play together' ideas throughout the book which are great for extra practical ideas. On the page above it offered some 'play with writing ideas' such as taking a big brush and water to draw circles and lines on the wall outdoors, which DD3 thought was great! I'm sure she's going to learn how to write her letters correctly whilst working through this book even though she thinks it's all just a 'bit of fun' at the moment. Check out Starting to write here and Number Problems here. DD3 also started this Number Problems book which is focused on doubling and sharing. I thought it may be a little early to start but the book offers lots of practical activities by sharing 'play together' ideas on each page. 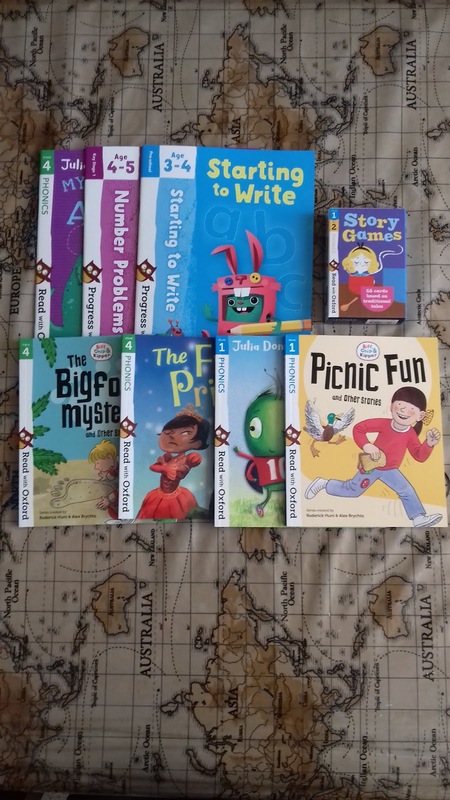 The Progress with Oxford series offer a 'constant companion' in each book which are little characters who help along the way, making it fun and enjoyable for the little ones. Whilst learning about doubling numbers, DD3 got out apples, cars and whatever else she could find to practise her doubling skills!! 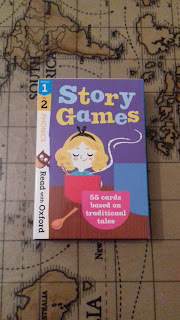 Check out this lovely pack of Story Games cards here. Now over the years I have accumulated a huge stack of flashcards (which are in a terrible mix most of the time) from alphabet and number cards to flags and types of leaves, you name it, we probably have it! There are many different cards to choose from out there. This story games pack was a nice surprise as it came through the door. It contains 55 cards which are based on well known traditional tales that all young children come across as some point. The pack comes with instruction cards for different activities that your children can enjoy, and is also part of the new Read with Oxford series. 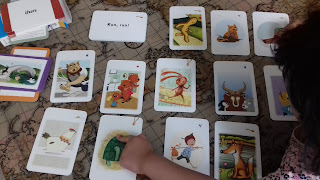 DD3 started by placing the picture cards in the correct order, retelling their favourite stories. 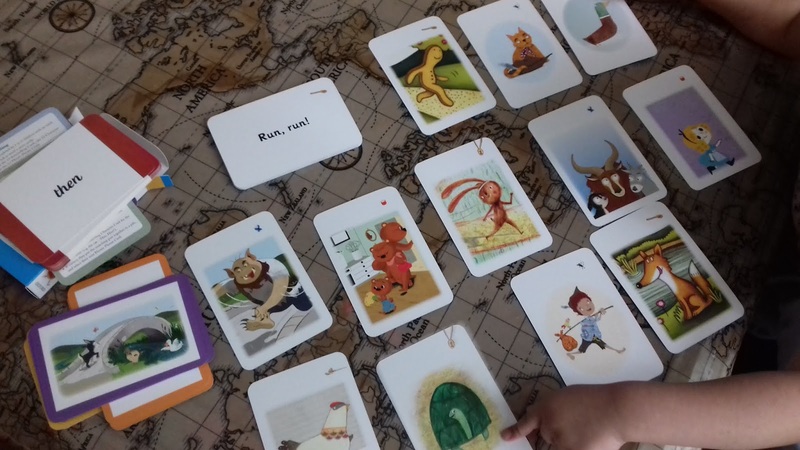 There are a number of ways to use the cards, we have also been reading the phrases, using phonics, and matching them to characters as well as developing their writing skills by writing their own versions of the stories. I'd love to hear how you will all use your cards!! Do you teach your children to read using the phonics method? If you do, then check out this new series of educational resources to propel your child's learning and give the a firm foundation in their reading skills. Please check out our Instagram page for some short clips of DS6 and DS3 using the books here. Disclaimer: I was sent these educational products in order to review and support the new launch. This post also contains affiliate links.